The global roller shutter market is anticipated to be driven by factors such as need for safety, security, and convenience, digitization &automation, and increase in population and trend of nuclear families. Roller shutters provide safety from natural disasters and burglary. They are gaining traction as they offer fire resistance up to certain number of hours. Galvanized roller shutters have a protective zinc coating to protect them from extreme temperatures to some extent. Built-on roller shutters are the most preferred product due to their durability. Manufacturers are introducing new product designs to form a new type of lath consisting of synthetic and metallic material to offer protection from the external environment. Pinto Srl, an Italy- based company, manufactures roller shutter laths made of aluminum, polyurethane, and PVC. Traditionally, roller shutters were operated manually. However, with time and with development of technology, consumers are moving to automatic and motor-operated roller shutters. Currently, roller shutters can be operated by one touch or remote control technology. Europe and North America significantly install automated roller shutters in their commercial and residential spaces. The use of mobiles and Android devices to operate the roller shutter is also driving the market. Roller shutters are not a luxury product, and they can be installed by anyone for the purpose of safety. Roller shutters with tilting laths are gaining popularity in the window segment which lets in air and sunlight in residential and commercial applications. Roller shutters are not expensive and can be installed by any household or small retail shop or kiosk. The trend of urbanization and nuclear families has increased the number of households in the world. Colonial shutters and accordion shutters are substitutes of roller shutters. Classically designed colonial roller shutters originated in Europe. These shutters reduce the frequency of storms and allow the entry of bright light. These advantages of colonial shutters are likely to hamper the growth of the roller shutter market. As demand for roller shutters is increasing due to additional security and insulation needs, manufacturers are looking for more advanced features including power saving and noise protection for consumer convenience. Therefore, product innovation and increased security and insulation properties for both personnel access and commercial/ industrial doors is likely to serve as key factors providing market opportunities. Government spending on infrastructure in emerging economies and strengthening of economies have led to increased spending by owners on home renovation projects. Rapid urbanization and industrialization in developing regions such as Asia Pacific are providing lucrative opportunities for the global roller shutter market. Over the years, industrialization and urbanization are two important transformations that have shaped APAC’s emerging economies. As the population is rising, the need to build more housing units in urban and rural areas to accommodate the growing population is likely to fuel the product demand. Commercialization and rapid urbanization in emerging economies including India, Thailand, and Indonesia will create more opportunities for industry growth. Some of the key trends in the roller shutter market is that the market trend is shifting toward high security and insulated roller shutters. Another trending factor is that existing buildings are being increasingly renovated due to the trend toward smart homes. 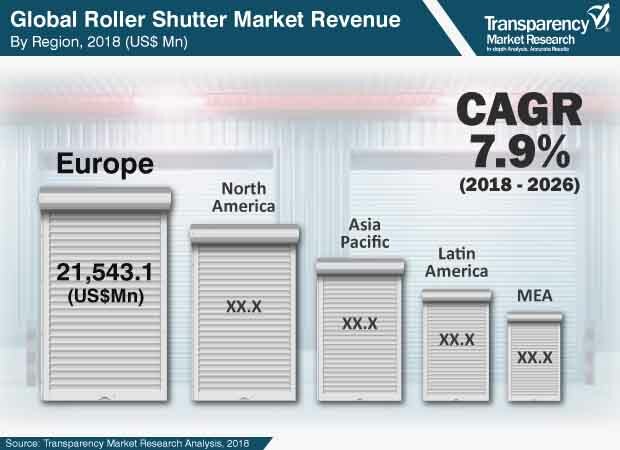 Some of the key players profiled in the global roller shutters market includes AM Group, Alulux GmbH, Assa Abloy Group, Bunka Shutter Co., Ltd., Ferco Seating Systems, Heroal, Hormann Group, Novoferm Gmbh, Sanwa Holdings Corporation, SKB Shutters, Stella Group, and Zurflüh-Feller.